This recipe is the result of not shopping properly. 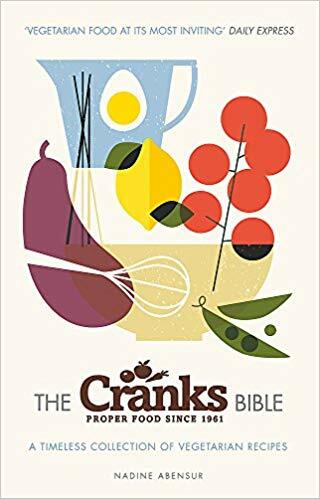 I thought I had bought everything needed to make this vegetable lasagne recipe from the Cranks recipe book, but it turned out I was missing a couple of key things. Sheets of lasagne. Crème fraiche. So I improvised and added a couple of extra things I happened to have. This is the result. It demonstrates that being flexible can often be a nice surprise. 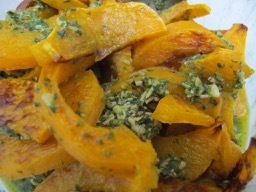 Whatever you change, always include the roasted butternut squash slices in pesto, that’s lovely! As with a lot of ‘vegetarian’ recipes, I find them sadly lacking in protein. So I added a tin of haricot beans which I had in the cupboard. It would work with any type of tinned bean. The separate elements for the lasagne can be prepared in advance, and assembled just before eating. Preheat the oven to 230°C/450°F/gas 8. 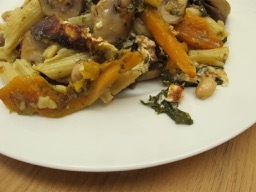 Place the slices of butternut squash in a bowl and toss with 2 tbsp olive oil, season to taste. Spread in a single layer on two baking trays and roast in the oven for about 20 minutes until soft when checked with a knife, and going brown around the edges. 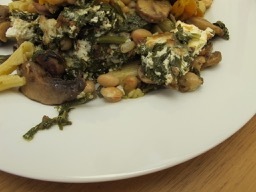 Put into a bowl to cool slightly, add the basil pesto and set aside. Meanwhile, cook the lasagne sheets or your own preferred pasta. Drain and set aside. Slice the cleaned mushrooms. Heat 1 tbsp olive oil, two chopped garlic cloves and the tamari in a wide frying pan. 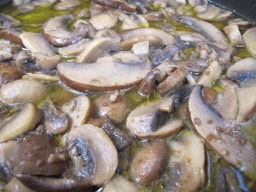 Add the mushrooms and cook gently until they begin to release their juices. 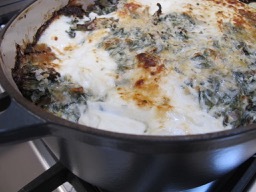 Add 1 tbsp crème fraiche, turn the heat down and simmer until the juices begin to reduce. Set aside. Turn the oven down to 190°C/375°F/gas 5. 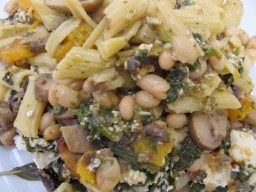 Layer the vegetables and pasta in a large ovenproof casserole dish, finishing with a creamy spinach layer and the remaining crème fraiche. 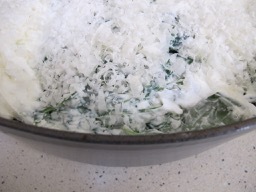 Sprinkle the top with the grated Gruyere or hard cheese. Pre-heat the oven to 190°C/375°F/gas 5. Assemble the dish as above. Bake in the oven with a lid on the casserole, or cover with a layer of foil, for 30 minutes. Remove the lid and continue to bake for a further 15-20 minutes until the cheese is melted and golden. Test with a fork to make sure the vegetables at the bottom of the dish are hot. What would I do differently next time? This entry was posted in A love of food and tagged food, recipes, vegetarian food on December 15, 2018 by sandradan1.